iii. For Home Guards, a person, who as on the date of Notification has been on duty as Home Guard for a minimum duration of 360 days within a period of 2 (two) years and who is still continuing his service as Home Guard, must have attained the age of 18 years and must not have attained the age of 40 years as on 1st July, 2018. The Upper Age Limit will be relaxable as detailed in the Notification. ii. For Post Code No. 35: Must possess pass in SSC or any other examination recognised by the State Government as being equivalent to SSC and must possess an Industrial Training Institutional Certificate in Wiremen OR Mechanic Motor vehicle OR Mechanic Diesel OR Fitter as on 1st July, 2018. Candidate should furnish the Driving Licence information (Grant of issue of Driving Licence), issued by the Licensing Authority of the RTA concerned along with the Application Form. 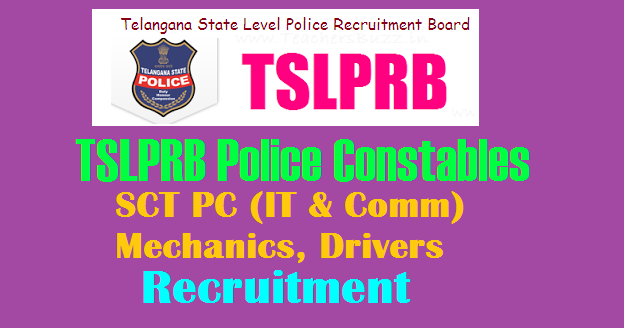 Fee: a) Candidates with local status of Telangana belonging to OCs and BCs applying for the Posts of SCT PC (IT &C), SCT PC (Mechanic) and SCT PC (Driver) have to pay a fee of Rs.800/- for each post towards Registration of the Application, Processing of Application, Conduct of Tests and Examinations, Maintenance of Portal etc., Local Candidates of Telangana belonging to SCs and STs have to however, pay only Rs.400/- for each post towards the same. All other Candidates will have to pay Rs.800/- for each post. Fee may be paid at TS Online / AP Online / MeeSeva (e-Seva) Centres / through Payment Gateway (Credit Card / Debit Card / Internet Banking).